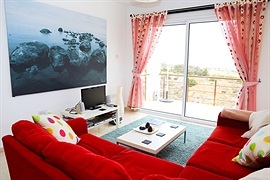 Holiday villas to rent in Esentepe Village near the Esentepe Golf Course in Northern Cyprus. When you first see the view from your holiday villa in Esentepe, you'll soon realise why ancient Greek heroes returning from the Siege of Troy decided to settle here! With its feet in the sparkling Mediterranean Sea and its head in the foothills of the dramatic Five Finger Mountains, the Esentepe area is a stunning location for a rental villa holiday in North Cyprus - and that's before we mention the impressive new 18 hole golf course. The village centre offers a good range of shops, yet you can still wander out from Esentepe into the mountains, amongst the apricot trees that give the air a delicate perfume all summer long. 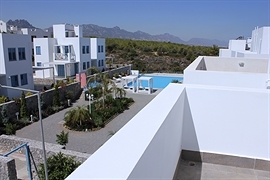 Just 20 miles east of Kyrenia, Esentepe offers so much on a villa holiday in North Cyprus, especially for the keen golfer - and their family! Any golf fanatic will enjoy playing the challenging course at the Korineum Golf and Country Club, set amongst ancient olive groves and dramatic mountain scenery, for a round of golf that will stay in the memory long after you finish your Esentepe villa holiday. 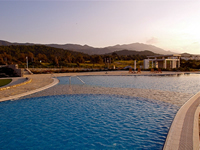 The rest of the family can enjoy all the other facilities at the Club, including the restaurant and spa. 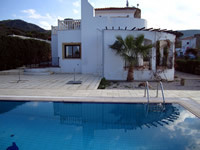 At any Esentepe villa for rent, when it comes to choosing a North Cyprus beach for the day, you are spoilt for choice. Head west along the coast road and enjoy the lively atmosphere and water sports at Acapulco Beach, or just relax under a sunshade! Your kids will adore Lara beach in North Cyprus, with its mixture of sand castle-perfect beach at one end, and limestone slabs pockmarked with rock pools at other, where parents can soak up the sun and keep and eye on the kids too. Just 20 minutes drive east of Esentepe is Kaplica Beach, a sandy bay overlooked by ruined Kantara castle. 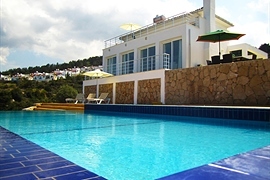 Kaplica Beach has everything you need for a great day out from your Esentepe villa, from sun loungers to showers, a restaurant and a snack bar. If you prefer near deserted beaches, the rugged Karpas Peninsula starts just east of Esentepe. Here, time seems to stand still, as you drive amongst fields of fragrant wild flowers, with tiny roads leading down to deserted rocky coves, while the wild donkeys wander the countryside at leisure. Back in Esentepe, you can mix with the locals whilst stocking your rental villa kitchen from the village shops. Or, forget about cooking in your holiday villa and try a pide (Turkish style pizza) at the Esentepe Restaurant, enjoy a traditional meze or kleftiko at Rosie's on a Wednesday night, or tuck into tasty grilled meats at Tumba - the owner is the son of the local butcher! 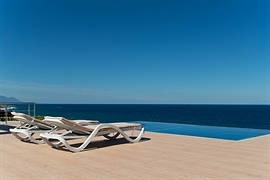 For the best holiday villas for rent in Esentepe, with Amy Villas you always score a hole in one! This page is prepared in 120 ms.